Do you remember the elevator scene in the children’s book Eloise? The spunky six-year-old guides readers through one of her daily antics in the Plaza Hotel: running up the staircases, skipping along the halls and riding up and down the elevators between the lobby and her top-floor apartment. The accompanying graphic, drawn by Hilary Knight, is a fold-out chart that depicts the floors of the Plaza with elevator routes, staircases and Eloise scampering along. 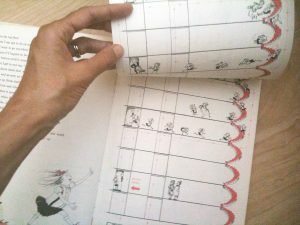 As a child, I remember loving this page— I would follow the dotted red line of Eloise’s path with my finger, captivated by what might otherwise seem a rather mundane adventure. Here she waves to the worried-looking elevator man, there she scares the maid, there she somersaults, and there again and again she pushes the elevator button. The appeal of Eloise may be in how accurately it expresses a child’s first adventures. Children are continually making whimsical mental maps of the world around them— what things are, how they relate to each other, and how to get around in it all. What do you remember about the places you grew up? I’m guessing your memories are as vivid as my own. My childhood’s dotted paths travel to the neighbor’s lawn that would be covered in ladybugs after the rain. Past the house that once burned down in the middle of the night. Along the route my sister and I swear we rode on our bikes to get to the ocean. These colorful memories, as striking in their detail as they are in their questionable reality, all seem (perhaps alarmingly) to be about times when parents weren’t around. It’s as if these first journeys into the world without adults, so full of discovery, freedom and excitement, left a deeper imprint in my mind than others. For most of us, the sense of wonder we experienced during our childhood explorations eventually gets dimmed by repetition and responsibility. We may be able to rekindle that childlike feeling of discovery when we travel to new places, but our day-to-day adventures along our building hallways and neighborhood streets have become less compelling. All the while, our longing (even if it’s unconscious longing) for that whimsical mental map-making grows. We want the satisfaction that comes from piecing together the world around us. We want to blur the edges of our everyday reality and look at our surroundings in a new way. We want to point to a dotted red line and know that we laughed, skipped and played along it. What map can you create today? In celebration of whimsical map making, I’m re-sharing a free gift. 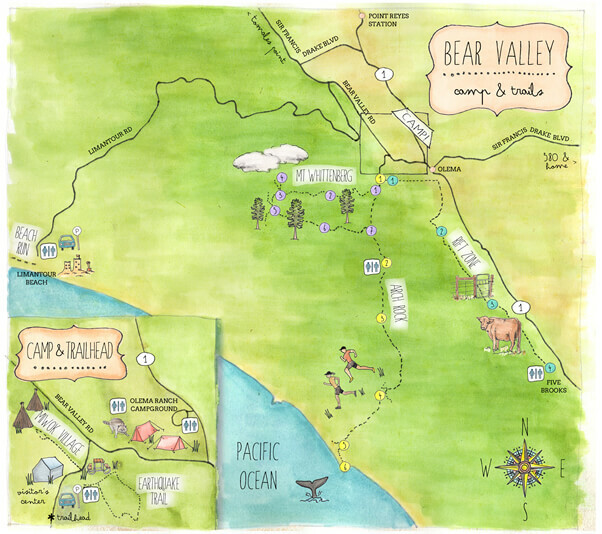 It’s a watercolor map of running (and hiking) trails in California’s stunning Point Reyes National Seashore, complete with an index of notes so you won’t get lost. Made originally for our Cross Country team’s annual camping trip, and available here for your enjoyment. Download, print and explore! Charming and nostalgic— thanks again Sarah for giving us a glimpse into another view, a new perspective. Your ideas and your drawings never cease to delight and enchant. Thanks Yoli! You’re the best! Now I need to go watch “Eloise”! Oh, that’s right! You grew up with an animated Eloise! Fun! Sign up for (very) occasional notes & doodles.